Pet therapy, something also referred to as animal-assisted therapy, has been gaining popularity. From animal visits for children in hospitals to those with dementia, and now people with cancer, studies suggest there are some important benefits obtained from these furry visitors. Mayo Clinic oncologist Dr. Edward Creagan says, "A pet is a medication without side effects that has so many benefits. I can’t always explain it myself, but for years now I’ve seen how instances of having a pet ​are like an effective drug—it really does help people." What are some of the ways that pet therapy has helped those struggling with physical and mental illnesses, and what are researchers starting to learn about its role in cancer treatment? Animals have been companions to humans since recorded time, but the use of this companionship to foster health and well-being has only recently taken off as a complementary therapy. Animal-assisted therapy (AAT) was first used to assist those with mental illnesses beginning in the 1800s. It was found to be a helpful adjunct to psychoanalysis by Sigmund Freud. Animals as companions to those with physical illnesses became recognized only as recently as 1976 when Therapy Dogs International—followed closely by the Delta Society (now called Pet Partners)—was founded. Pet therapy has been used and studied in many forms. Research has looked at both pet ownership as well as visiting pets and how they can relate to overall health. What Animals Are Used for Pet Therapy? The type of animals that have shared their lives with people who are ailing is also diverse. Most commonly studied have been dogs (canine therapy) with the most popular breed for pet therapy being golden retrievers. But, benefits have been found via companionship with cats, birds, farm animals, and even dolphins. Many studies have been done that have evaluated both the physical and emotional effects of pet companionship. 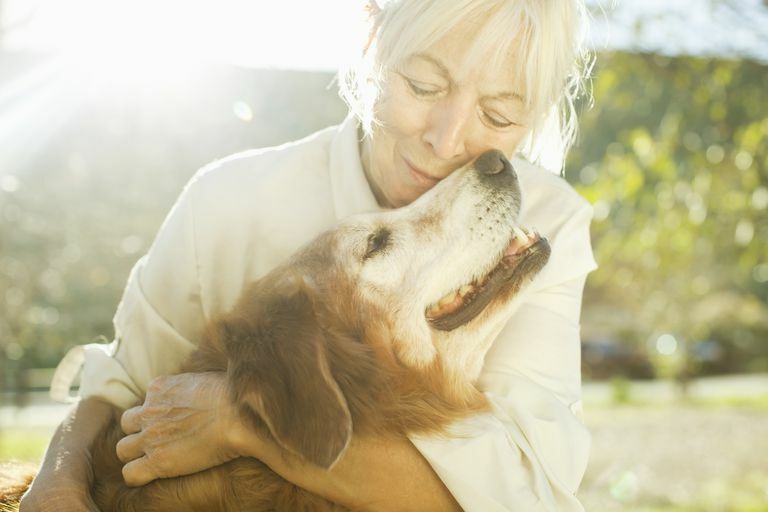 With regard to pet ownership, studies have found health benefits and the American Heart Association issued a scientific statement in 2013 saying evidence suggests pet ownership reduces cardiac risks. As an added plus, it’s been found that pet therapy not only helps those with physical and emotional needs but appears to benefit the entire family, as well as the hospital nursing staff in those who are hospitalized. These studies continue, and results have been mixed, so conclusions should be regarded as preliminary and not definitive. Why Does Pet Therapy Work? There are several theories that have attempted to explain why pet therapy helps those with physical and mental conditions. Intuitively it seems that relaxation as well as buffering the stressors would play a role. Researchers have actually found a physiological basis for this effect. A study on healthcare professionals who were visited by a pet therapy dog found that those who had time with the dog had a significant decrease in cortisol levels in the blood. This "biological" stress reduction was noted with as little as five minutes of time spent with the dog. Another study found that AAT decreased catecholamines in the blood. To understand the significance of this, chemicals in our bodies such as cortisol and the catecholamine epinephrine (adrenaline) are known as stress hormones. These chemical messengers do have a place and a role in the functioning of our bodies. As instigators of the “fight or flight” response, they are what make us alert if we hear a prowler in the middle of the night, or have to fight off a lion in the jungle. On the other hand, chronic increases in these stress hormones have been linked with heart disease and possibly even cancer and cancer recurrence. Pet therapy appears to affect another type of chemical in our bodies as well— endorphins. Endorphins are chemicals secreted by the body that act as the body’s natural pain relievers. They are responsible for what has become known as the runner’s high. At least one study has found that animal-assisted therapy has resulted in an increased level of endorphins in patients who have spent time with a dog. Behavior problems: Animals, just like people, do not act perfectly all the time, even those who are carefully trained. Allergies: Some people have allergies to animals. People who are immunosuppressed: People who have bone marrow suppression, for example, due to chemotherapy, should talk to their oncologist before considering pet therapy. Disease transmission: There is a small risk that diseases carried by animals may be transmitted to humans. These are known as zoonotic diseases. With animals that are carefully screened, the risk of zoonotic diseases should be small. Fear of animals: Pet therapy is not a good idea for people who are frightened by animals such as dogs. Respect for the animal: As a final note it’s important to think of the creature on the other side of therapy. Animals that are used for therapy should not be exploited or placed in situations that could be uncomfortable or harmful. If you are looking for a way to add pet therapy as a complement to your cancer treatment plan, it is best to start with your cancer treatment center. Discuss it with your doctor and others on your medical team. They may have a formal program or they may be able to accommodate your wishes. If you are interested in getting involved with pet therapy as a volunteer, there are many organizations that can help you get started. First, if you wish to use your own dog, you'll need to see if your dog is a good fit for the program. The next step is to see if your dog passes the "Canine Good Citizen Test" developed by the American Kennel Club. You can search by state to find evaluators who can administer the test. It’s important to note that pet therapy isn’t limited to dogs. Research has found benefits from therapy cats as well as other animals. Johnson R, Meadows R, Haubner J, Sevedge K. Animal-assisted activity among patients with cancer: effects on mood, fatigue, self-perceived health, and sense of coherence. Oncology Nursing Forum. 2008. 35(2):225-32. Marcus D. Complementary medicine in cancer care: adding a therapy dog to the team. Current Pain and Headache Report. 2012. 16(4):289-91. Marcus D, et al. Animal-assisted therapy at an outpatient pain management clinic. Pain Medicine. 2012. 13(1):45-57. Marcus D. The science behind animal-assisted therapy. Current Pain and Headache Report. 2013. 17(4):322.